The Oblates of Annunciation Monastery are Christian individuals or couples who have associated themselves with a Benedictine Community in order to enrich their Christian way of life. They shape their lives by living the wisdom of Christ as interpreted by St. Benedict. They seek God by striving to become holy in their chosen way of living. By integrating their prayer and work, they demonstrate Christ's presence in society. 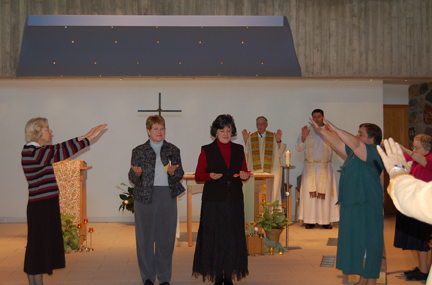 Oblates of Annunciation Monastery concern themselves with striving to be what they are, people of God. Their prayer life flows from this awareness, as does their willingness to offer themselves for the service of God and neighbor to the best of their ability. These men and women promise to lead an enriched Christian life according to the Gospel as reflected in the rule of St. Benedict. In this way they share in the spiritual benefits of the women and men of Benedict who are dedicated to the monastic life by vows. This year we will continue to read Michael Casey's book, The Road to Eternal Life, Reflections on the Prologue of St. Benedict's Rule. Casey reminds us that the first word of the Rule is: Listen. Bend the ear of your heart to receive gladly the advice of a kind father, and fulfill it in practice. Let us, with the Gospel as our guide, listen with the ear of the heart as we continue on this journey to eternal life. *All are welcome to join us for Mass at 11:00 a.m. on Sundays, and lunch thereafter! 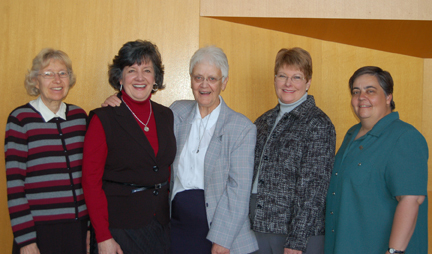 For more information on the Oblates of Annunciation Monastery, contact Oblate Director Sister Patricia Schap at (701)255-1520.